In case you haven’t heard, WordPress is kind of a big deal. In fact, they are one of the top content management systems (CMS) in the world and power nearly 30% of the web. Much larger than the simple blogging tool most people are familiar with, this open-source software is used to create and manage beautiful-looking and fully-functional websites or blogs. It’s easy to use, flexible, and best of all, it’s free! Hundreds if not thousands of volunteers from all over the world are constantly improving upon and creating new code for WordPress, leaving users with a huge repository of themes, plugins, and widgets to enable building just about any kind of website imaginable. 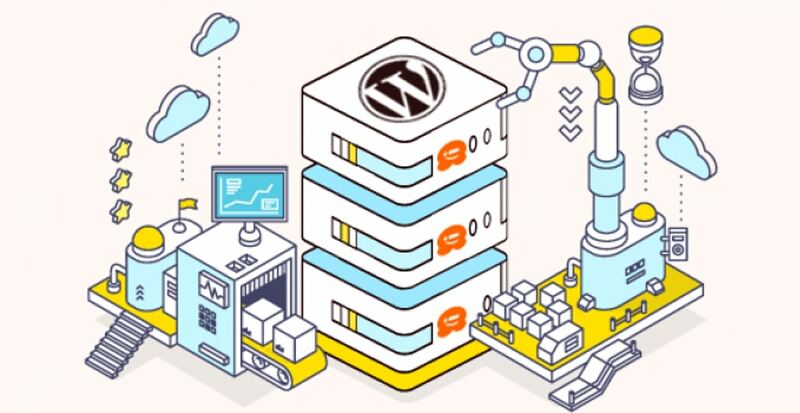 Due to WordPress’s huge popularity, most popular web hosting providers offer some form of WordPress integration and services, such as easy one-click install options for WordPress and the basic requirements of PHP version 7 or greater and MySQL version 5.6 or greater. It’s generally understood by anyone reviewing the top WordPress hosting providers that SiteGround just has to be on that list. Founded in Sofia, Bulgaria in 2004, SiteGround has made a name for themselves by playing a prominent role in the WordPress community for some time now. Their hosting platform is optimized for WordPress servers, plus they also offer managed WordPress hosting at very competitive rates hard to find elsewhere. Even WordPress.org has vouched for SiteGround as a solid WordPress hosting provider. SiteGround offers some great WordPress friendly features, including a free wildcard SSL certificate, daily backups with up to 30 copies, staging, advanced caching, free PCI compliance (for e-commerce) and fast support on their GrowBig and GoGeek plans. These plans are generally the more WordPress-optimized packages SiteGround offers. While they’re a little pricier than the StartUp package, the perks are worth it. Getting your WordPress site up and running is a cinch with their built-in installer, making the installation process seamless. SiteGround has a vast online community which are always happy to give positive feedback in all variety of SiteGround reviews. InMotion Hosting is another popular contender for excellent WordPress hosting. Their Launch plan is optimized for WordPress specifically and is also the most affordable. It comes with SSD disk space (known for their superior performance), a free SSL certificate, and hosting that includes two websites on the plan. With InMotion hosting, they offer WordPress pre-installed as part of the package. This is excellent for those who want the process to be as easy as possible. You don’t have to handle the WordPress installation at all since it’s done automatically. During checkout, all you need to do is to click the correct checkbox. InMotion also has a lot to offer in terms of customer support and help with launching your website. They offer a ton of tutorials and guides on various hosting topics. They even have a channel dedicated to WordPress. A2 Hosting has been around since 2001 when they were a small company called Iniquinet (good call changing the name!) and has gone through massive rebranding which has resulted in A2 Hosting. Now established as a widely used hosting provider, A2 Hosting has also established themselves in the WordPress space as a solid provider with good performance and affordable prices. Their WordPress hosting is based off of their principals of being developer friendly, offering quality performance, high security, and a WordPress-optimized environment. Each of their WordPress hosting plans come with WordPress pre-installed, with the added option of installing new instances through their one-click installer. A2 Hosting also guarantees 99% uptime. While they’re one of the more expensive WordPress hosting providers on the market, WP Engine nonetheless offers very high quality services. With their entry level Personal plan, you’re allotted one WordPress install that can handle up to 25,000 visits per month, making it the perfect plan for smaller websites. This WordPress-centric host delivers a seamless installation process that they take care of themselves so you don’t have to do anything but sign up. They also offer superior managed WordPress hosting which takes care of optimizing your site for performance, keeping it secure, and keeping regular backups. Similar to other web hosts on this list, Bluehost makes the WordPress installation easy with a one-click install that is handled by a service called MojoMarketplace. The only knock on Bluehost is that this interface can be a little confusing. Be careful not to accidentally install multiple instances of WordPress, which is easy to do. One of the oldest hosting providers on the market is DreamHost. Established way back in ‘97, DreamHost has built itself on a solid reputation as a web hosting provider and now hosts over 1.5 million websites today. They offer both a shared plan and a managed one aimed towards WordPress users. With each plan, you can host unlimited websites with all of the bandwidth and space you’ll need. Despite being a little more pricey than other base packages on this list, DreamHost’s standard shared hosting package is one of the most popular and boasts a one-click install and a straightforward interface easy to navigate. HostGator is another renowned player in the web hosting world, but hasn’t always been the best. The quality of their hosting plans have been a point of contention for a while now, but they’ve come back in the past couple years with a strong offering for WordPress users with their WordPress Cloud hosting plans. Their signup process is pretty straightforward and leads to the traditional cPanel setup. WordPress installation has also been made painless using their built-in cPanel WordPress installer. HostGator guarantees 99.9% uptime along with 24/7 customer support. GoDaddy has long established themselves as a distinguished web hosting provider, powering thousands of websites online and offering a variety of quality web hosting services at a great price. WordPress lovers can rejoice in their feature-rich and low-cost WordPress hosting plans. Their plans offer an auto-install WordPress feature, excellent security, and quality performance. With a modern take on cPanel which was intuitively laid out, GoDaddy is probably one of the easiest WordPress hosting providers to navigate. GreenGeeks is a bit newer on the WordPress hosting scene but is definitely worth checking out. Founded in 2008 by Trey Gardner, they now host over 300,000 websites with datacenters in the US and Canada (with Amsterdam soon-to-come). They guarantee 99.9% uptime and tools that will help you easily manage your WordPress site. Installing is also a breeze with their one-click installer, which also comes with WordPress CLI and Git pre-installed. GreenGreeks has a very security-first approach to their hosting with features like automatic WordPress core updates, DDoS protection, brute force, account isolation, and real-time security scanning to give you peace of mind. The last in our list of officially recommended WordPress hosting providers is none other than Flywheel, a host offering fast speeds, quality performance, and support to keep your WordPress site operating smoothly. This WordPress-centric hosting company is built for beginners, agencies, and designers. Their dashboard is incredibly simple and clutter free, making it easy to navigate while also having a beautiful interface. Flywheel is custom-built for the WordPress platform and that’s all they host. Having a team of experts in WordPress specifically means quality support and ease of use to get your site up and running. A few features they offer include managed software updates, managed WordPress security, free SSL certificate, CDN included, caching and performance included. If you have a WordPress website, make life easy by investing in WordPress-specific hosting. It’s often as easy as one-click and comes with superior customer support by a team that lives and breathes WordPress. When it comes to plans, every web host on this list offers multiple plans that should be selected based on your specific needs. Paulius is an opportunistic entrepreneur with an extensive web hosting background who loves to spend his free moments writing music.